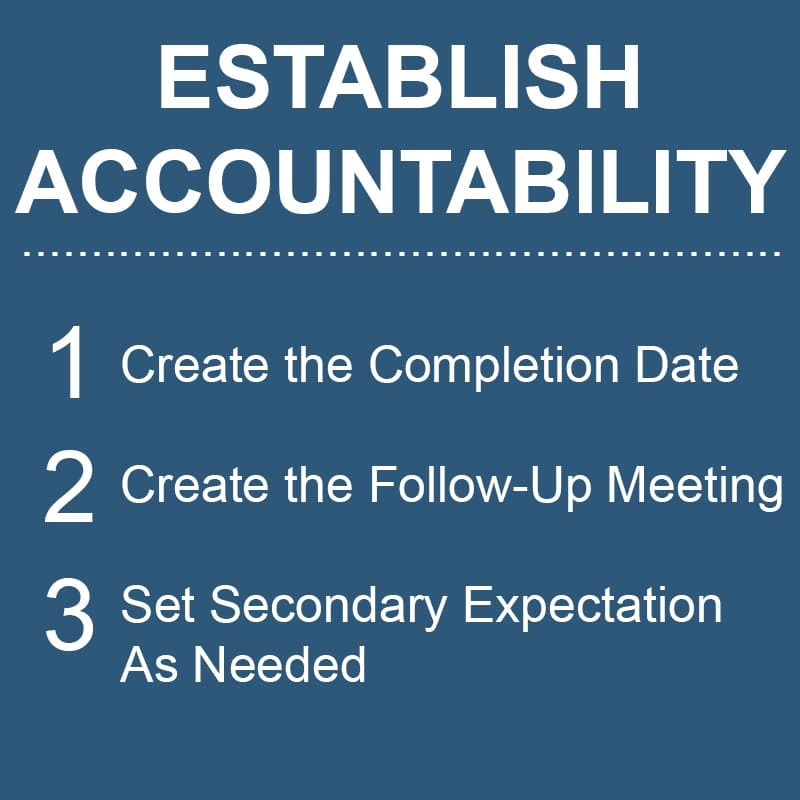 Today we are looking into how a successful accountability meeting should go. To prevent projects from being completed late, receiving inadequate results or possibly never even getting to completion, the accountability portion in the 6-step delegation process may be the most important step of all. An accountability meeting may be the most important step in the 6-step delegation process to prevent projects from being completed late, receiving inadequate results or possibly never even getting to completion. To maintain accountability, the first thing to do when you have assigned or delegated a project or responsibilities, is to create a completion date. You must answer for the employee, “When must this be completed by?” I’m big on, whenever possible, having a negotiated completion date. In other words, you are delegating or assigning the responsibility to the employee, however, you want them to be in on identifying and determining what that completion date would be. Here’s an example of what you could say, “Alyson, you pretty much know what we’re looking for now, right?” Again, reference our earlier conversation regarding the previous 5 steps in the delegation process. The employee will respond, “Yes, I think we’re pretty clear.” “Alright, the only thing we need to do now is determine when we can get this thing wrapped. So, Alyson, when do you think you can have this task completed?” Then fall silent, leaving the employee to speak next. Now, remember, we’re negotiating a completion date. You may say to me, “Well, Phil, have you forgotten that you assigned me a task three days ago that’s also due within the next _____.” I may have done just that, forgotten it. You have every right to come back and say, “What about _____?” Now we’re trying to negotiate projects and various completion dates. It truly becomes a collaborative effort — we’re working together as a team. It may not seem that way initially, but, eventually the person who is being delegated to will start to see it. Now, let’s be honest. You know when would most people get started on an assignment that’s five weeks out. That’s right — midway through the fourth week, right?! This is where the accountability meeting is crucial. Now, in all reality what you have done is moved the “actual” start date. Your employee will likely still wait closer to the follow-up date to start, but now you have the project starting sooner. Here’s the interesting thing about 85% of the time. When the employee comes in for the follow up meeting and you ask, “What do you have to report?” — your employee is likely to say, “Well, I think I’ve almost got it finished.” Why does this happen? Because it is not finishing a job that is the hardest; it is oftentimes getting started that is the hardest step. Once you have started preparing something for the report date, it is easy to think, “Well, just a few more minutes or a couple more hours, and I could have this thing wrapped up and completed.” That’s a win-win for everyone, right? Now that’s 85% of the time. About 5 to 10% of the time maybe, someone will say, “Well, I’m not quite finished, but I’m making good progress, and here’s the progress I’m making.” Again, completely acceptable, as long as it’s going in the direction that we need for it to go. But here’s what you have to be ready for — this is the hard part — about 5 or 10% of the time, the person that has been delegated to comes in to the accountability meeting and says, “I’ve been really, really busy and I haven’t done anything at all.” This is where the rubber hits the road in terms of accountability. Increase your impact and influence as a leader. As long as people are doing what they said, accountability is an easy thing. But what happens when they don’t do what they said they would do or when they don’t do what was expected of them? Your response to underperformance shouldn’t involve any kicking, screaming, profanity or histrionics. In the follow-up accountability meeting, if performance has not been made as expected, you simply ask, “Did we not agree that you’d give me a report on your progress up to to date, as of today?” The employee will respond, “Yes.” “Well, obviously, you didn’t meet that deadline. Now the completion deadline causes me some concern. Here is what I’m going to do. Three days from now, I want, on my desk, a report of what you’ve done so far. I want to make sure that we’ve got ______ and _______ and ______ completed.” Be very specific with your employee. The point of setting this second expectation is to get the project back on schedule. It’s not overdue yet, but nothing has been done to this point. Now something needs to be done. Book Phil for your next Conference!